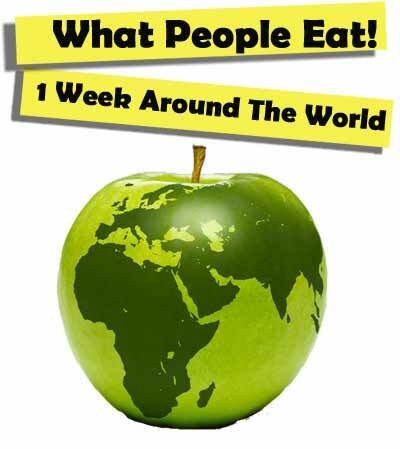 Think you know what other people eat around the world? 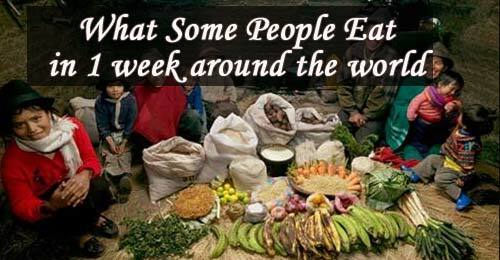 Take a look at how much and how little the rest of the world eats compared to your country. You just might be surprised! 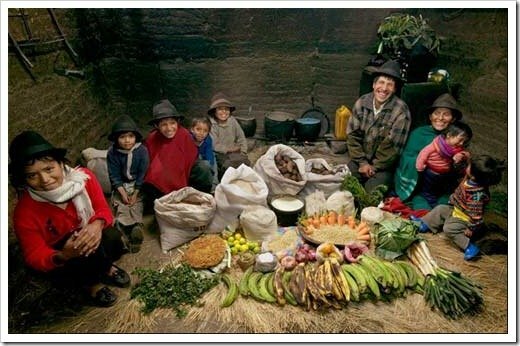 Peter Menzel and Faith D’Aluisio, a husband and wife team from California travelled to 24 countries around the world photographing and documenting what 30 families eat during the course of one week. 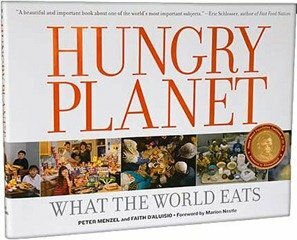 This clever couple put their findings in a book called Hungry Planet: What The World Eats. 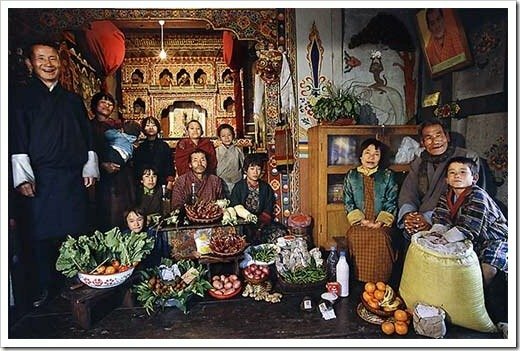 Each of the families profiled in the book include detailed interviews, a description of their weekly food purchases, their favourite foods and photos of them in the market and at home surrounded by a weeks worth of groceries and more. I have pulled together a a selection of those images from the book below. 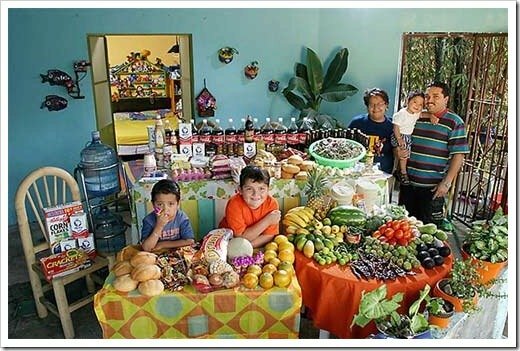 Lots and lots of fruits but check out all the coke on the back table. Holy coke-a-moly! 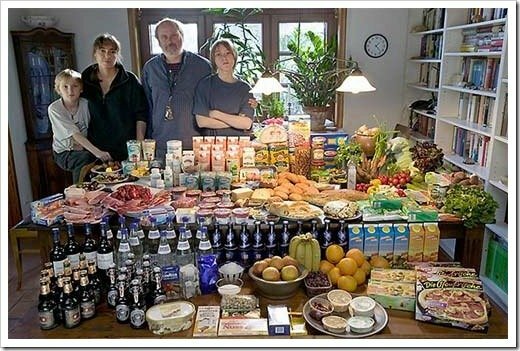 *Humbling, notice all the bananas or Plantanes and bags of grain and potatoes and the lack of processed stuff. Not many vegetables or fruits looks mostly processed and they said one of their favourite foods is mayonnaise sandwich? Please tell me that’s a pseudonym for something else. I see lots of leafy greens along with beer and wine. Where are the sausages and curry wurst? Looks about right. Notice the Nutella way in the back. No milk. Lots of yoghurt and cheese but seriously where are the baguettes? I do not know one French person who does not eat baguettes at least once a week. Makes me wonder. I had to stare at this photo for a very long time. I feel totally humbled by this image. Is that all the water they drink in one week between all of them? I see the grains and maybe rice but they have no fruits veggies? 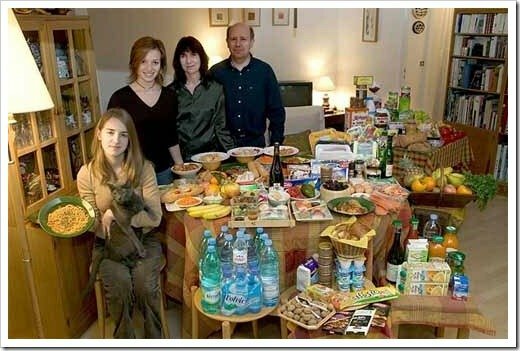 Is this really enough to sustain them or is it that we ( the rest of the world) eat too much? Wow, this looks amazingly good and healthy. Lots of veggies and fruits and hardly any carbs at all. Lots of water. Makes sense. It’s hot in Australia. A good mix of meat, beans and fruit. Still seems like a lot of processed food in the back on top of the stove. Where is the Vegemite? 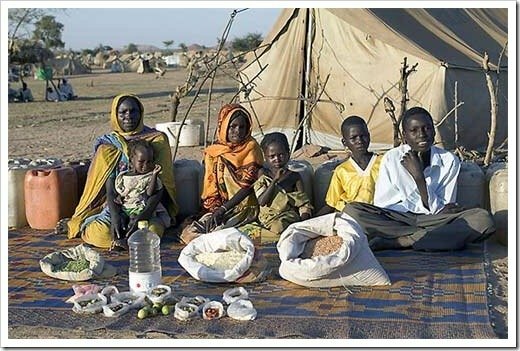 What’s interesting is that this family has the smallest amount of veggies on the table after the Americans who had 2 whole tomatoes. No veggies although they do consume lots of fruits. 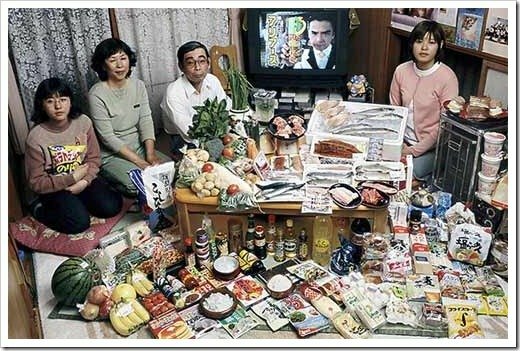 Check out all the pre-packaged foods on the floor. Notice very little red meat and chicken. Mostly fish. Lots of greens, fruits and look at that big bag probably filled with rice. 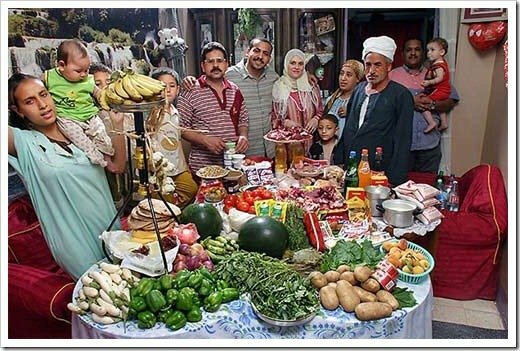 What people eat around the world varies family to family of course but there is something to be said about these eye opening photos. 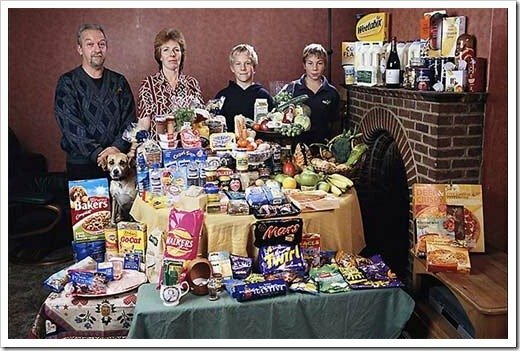 The western world in general eats a lot of processed foods. Cereals, bread, chips, sodas etc. 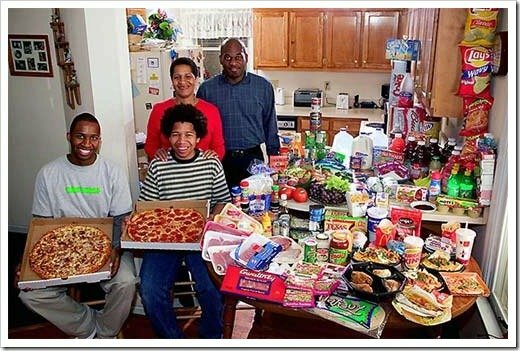 Many families don’t eat enough greens, vegetables or fruits. 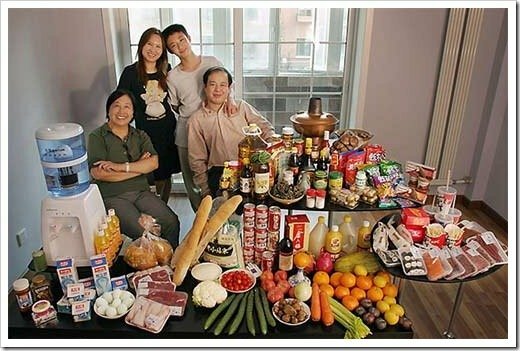 Even parts of Asia seemed to consume a large amount of processed foods. In other countries where these processed foods are perhaps less readily available, or perhaps just because of cultural reasons, more fresh produce is eaten like in South East Asia, Egypt and Africa. 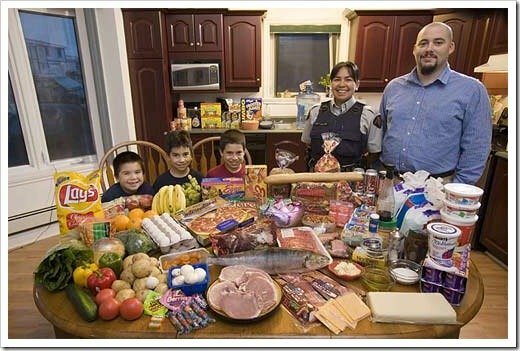 If we were to take a picture of what you and your family ate in a week, what would it look like? Would it have more processed foods, more fruits, more veggies or a mix? 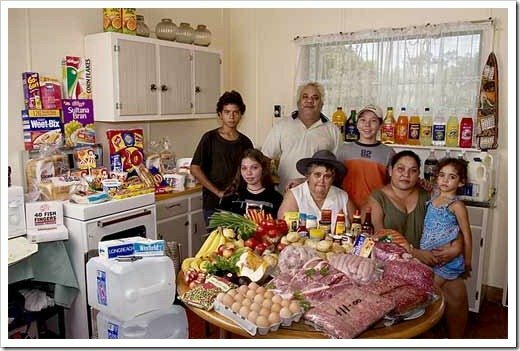 Ours would have a lot of broccoli, apples, mangoes and oranges along with a big bag of rice and some meat. We rarely eat potato and don’t drink soda except when we go out to a restaurant once in a while. Pick up a copy of the whole book at Amazon loaded with way more interesting photos and detailed interviews. This is a great book to share with the kids too.